as Furman defeated VMI 87-57 Saturday. Photo courtesy of Furman. Two-and-a-half months ago, Furman's football team outscored VMI 28-0 to pull away for an easy win. On Saturday, the Furman men's basketball team did one better with a similar result. The Paladins used a 29-0 run to pull away for an 87-57 win at VMI in the Southern Conference opener. Furman (10-4, 1-0 SoCon) overcame a 50 percent shooting day at the foul line, by shooting 50.8 percent (31-of-61) from the floor, including 51.6 percent (16-of-31) on 3-pointers. Eight different Paladins drained a 3-pointer as the 16 tied for the third-most in school history. 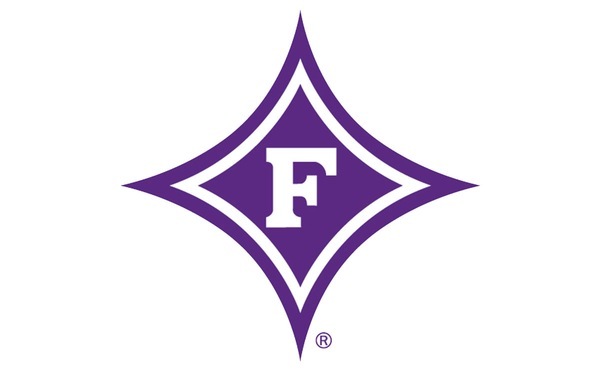 "We knew we'd be a little rusty not playing since the 20th, but the balls went in and the ball was moving for the most part," Furman coach Bob Richey told The Furman Sports Network afterwards. "Our ball movement was pretty poor in the beginning of the game, but I was pleased to see them be able to dig through some of that adversity." That adversity included a 1-for-11 start from the floor for Furman over the first 7:25 of the game. With less than 11 minutes left in the first half, VMI led 15-6. But by the time VMI scored another 15 points, Furman led 62-30 with 12:55 left in the game. Furman's run total was staggering. The Paladins trailed 15-6 before hitting five 3-pointers in a 24-0 splurge over just 4:37 of game time. Furman hit five 3-pointers during that flurry, including a pair by Daniel Fowler that gave the Paladins the lead for good. That run reached 29-0 a couple of minutes later as the Keydets went scoreless from the 11:19 to 3:22 mark of the first half. "I thought Fowler got us going. He had a little spurt there where he really played with confidence and brought energy on both ends of the floor," Richey said. "His leadership today was phenomenal." Jalen Williams' dunk with eight seconds left made it a 35-3 run and gave Furman a 41-18 lead at the break. A little over five minutes into the second half, a Clay Mounce putback dunk gave the Paladins their biggest lead of the game at 60-24 as the run reached 54-9. "Jordan Lyons gave us a really good spark off the bench, but I thought our whole bench played well," Richey said. "Clay Mounce is getting acclimated to the defensive intensity that we play at, but he's really coming on. We're really excited about what he can bring to this team." Lyons hit five 3-pointers to lead Furman with 17 points in 21 minutes. John Davis had 15 points, while Fowler had 12 points and five assists. The Paladins finished with 20 assists, giving them at least 20 in a game for the fourth time this season. Fowler, who eclipsed the 1,000-point mark in his career Saturday, seemed most pleased with the zero half of that 29-0 run. "Defense is what's going to carry our team to a championship level," said Fowler. "Regardless of how our offense is going ... as long as we stop the other team from scoring, we'll be alright." Freshman Bubba Parham had a game-high 21 points for VMI (5-7, 0-1). Furman returns to action Thursday, hosting rival The Citadel at approximately 7:30 p.m. It will be the second game of a doubleheader as the Furman women face Samford at 5 p.m.